The 229-L Water Matric Potential Sensor measures soil water potential from 0.1 to 10 bars. 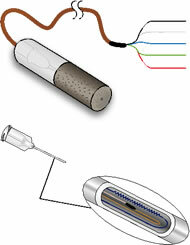 The sensor consists of a heating element and thermocouple emplaced in epoxy in a hypodermic needle, which is encased in a porous ceramic matrix. To calculate soil water matric potential, a Current Excitation Module applies 50 mA to the 229's heating element, and the 229 thermocouple measures the temperature rise. The magnitude of the temperature rise varies according to the amount of water in the porous ceramic matrix, which changes as the surrounding soil wets and dries. Soil water matric potential is determined by applying a second-order polynomial equation to the temperature rise. Users must individually calibrate each of their 229 sensors in the soil type in which the sensors will reside.